Personality: Helpful, but likes to most of the time work alone. Determined until the end. Can sometimes be a bit reckless, but is a great brother to Mega Man. Age: ??? Although if you go by game release...1989-2010=21 yrs. Game: Mega Man 3 and forth from there. Standard Attack: Proto Buster. Works the same way Mega Man's Mega buster does. 1st Skill, Ablility, and/or Weapon: Proto Dash. Uses 10 units, and does 5 damage. However, he copies the next exact move next turn. 2nd Skill, Ability, and/or Weapon: Triple Stomp. Roll 3 dice. If it is 1-3, does 10 damage for that die. 4-6 is 20 damage for that die. Uses 16 units. 3rd Skill, Ability, and/or Weapon: Angle Shoot. Roll a dice. if it's a 4-6, starts or continues a combo. Starts at 10 damage. For each time in a row that it gets one of those numbers, multiply the damage by 2. If it doesn't, it won't do anything. Uses 5 units each turn. 4th Skill, Ability, and/or Weapon: Unit Transfer. Can transfer however many units to or from Mega Man. Costs nothing. Cannot attack the next turn. 5th Skill, Ability, and/or Weapon: Proto Shield. Doesn't get hurt at all. If a type of bullet however, it will reflect it back, and deal 30 damage. Uses 15 units. History with your Amigo: Protoman is Mega Man's older brother, yet they did not know this until Proto (Break) Man saved Mega Man in Mega Man 3. Dr. Light then explained the whole story to Protoman and decided to join Mega Man on his quest. However sometimes they battle each other for fun to see which one Dr. Light made stronger. 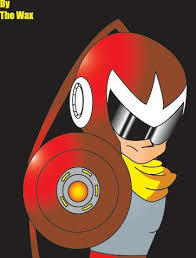 It is also said that Protoman was first robot EVER to be made by Dr. Light. Extra info: Uses the same units system Mega Man does. Everything seems to check out, approved. Thanks, and if the secondary character comes in effect, Proto's going to take that place!